Change things up with these side-trips from Honolulu: Kailua Beach Park (in Kailua) and Haleiwa (Sunset Beach Park & Waimea Bay). 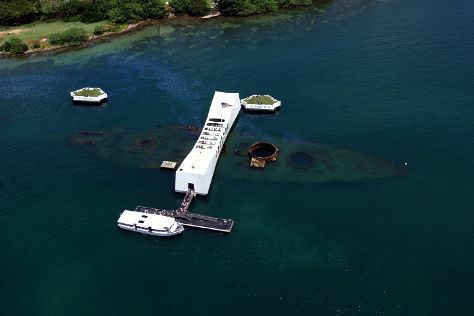 There's much more to do: explore the galleries of USS Arizona Memorial, see the interesting displays at USS Bowfin Submarine Museum & Park, admire the sheer force of Manoa Falls, and take in the pleasant sights at Diamond Head State Monument. To find maps, traveler tips, where to stay, and tourist information, go to the Honolulu trip planner . Nashville to Honolulu is an approximately 13-hour flight. You can also do a combination of car and flight; or do a combination of bus and flight. The time zone difference when traveling from Nashville to Honolulu is minus 4 hours. In February, Honolulu is warmer than Nashville - with highs of 81°F and lows of 69°F. Cap off your sightseeing on the 4th (Mon) early enough to travel to Lahaina. Kick off your visit on the 5th (Tue): kick your exploration up a notch at some of the top local zipline courses and adventure parks, then kick back and relax at Ka'anapali Beach, and then pause for some photo ops at Lahaina Jodo Mission. On your second day here, make a trip to Lahaina Banyan Court, then meet the residents at Maui Ocean Center, and then take a tour by water with Boat Tours & Water Sports. To see other places to visit, photos, where to stay, and other tourist information, use the Lahaina road trip tool . You can fly from Honolulu to Lahaina in 3.5 hours. Alternatively, you can do a combination of flight and ferry; or do a combination of flight and bus. In March, plan for daily highs up to 78°F, and evening lows to 67°F. Wrap up your sightseeing on the 6th (Wed) to allow time to travel to Kailua-Kona. On the 7th (Thu), get a new perspective on things with Boat Tours & Water Sports and then get close to the beloved marine mammals with a swim-with-the-dolphins experience. For more things to do, traveler tips, where to stay, and other tourist information, read our Kailua-Kona trip itinerary maker . Traveling by flight from Lahaina to Kailua-Kona takes 4 hours. Alternatively, you can do a combination of bus and flight; or do a combination of bus and flight. In March, daytime highs in Kailua-Kona are 81°F, while nighttime lows are 70°F. Finish your sightseeing early on the 7th (Thu) so you can travel back home.